Al Arabiya English: Let me start with the agenda behind Secretary Pompeo’s visit. I know we are still in the middle of it, but going by what has happened so far, how do you see it going. What are the highlights and what do you hope to achieve? Brian Hook: We are in the region for a visit to nine countries and the Secretary has now made a number of visits to the region, and it’s always a great pleasure for him to be in Abu Dhabi and to see His Highness, to meet with the foreign minister, and to keep working bilaterally. The ties between the United States and the United Arab Emirates couldn’t be any better, and we’re enjoying such close relations at all levels. The Secretary in Cairo announced that we will be convening a global ministerial on the Middle East in February, that’s going to be hosted by the US and co-hosted by Poland in Warsaw, and there will be countries from every region in the world. It’s a chance to talk about how to promote security and stability in the region and we’re very excited about that meeting. Al Arabiya English: The Cairo speech set the tone for Secretary Pompeo’s visit to the region. He said that when America retreats it leads to chaos, and the perception that has existed for a while now that there is a retreat happening. Isn’t that a contradiction that he is having to ride out? Brian Hook: It’s hard to argue that we’ve been retreating after largely defeating ISIS. It is not a distant memory to recall people being beheaded on beaches, and a terrorist army in the very heart of the Middle East and we have liberated almost all of the so-called caliphate. When the President had come into office, he ran on defeating ISIS and made it a priority from the very beginning. We have been enormously successful, and I think people often lose sight of how much we have accomplished. How can you say we are disengaging when the President’s first international trip is to Riyadh? In the meeting in Riyadh, representatives of 55-57 countries attended. His first trip internationally as president was to this region. We have adopted an entirely new strategy when it comes to Iran, one that doesn’t have any historical precedent. We have imposed the largest number of sanctions in one day against Iran in American history. I can go on, we have a very robust agenda and we’re very happy with our foreign policy accomplishments in less than two years. I can also talk about Syria where our mission has not changed at all. We will continue to crush ISIS, we have demonstrated that we have credibility in that issue. After taking 80-90 percent of territory away from ISIS, we are in a position to say that we will continue to crush ISIS. Our troops are leaving Syria, but that’s going to be done, as the president said, in a very deliberate and prudent manner, and we will take all necessary action to ensure that ISIS is not able to emerge and so, the mission had not changed at all. People should not misinterpret that. Al Arabiya English: I have been watching a couple of your addresses directed at the Iranian people, and that seems a very unique way of engaging with the Iranian people. Where did the idea come from and how has it gone so far? 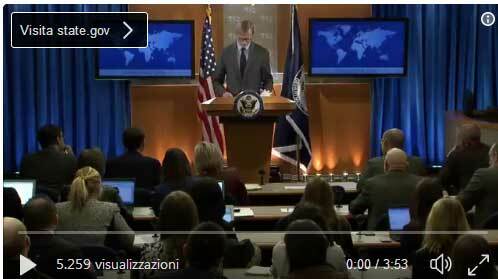 Brian Hook: It has been a priority of Secretary Pompeo, from the time he entered office. And then when he asked me to be Iran envoy he made it clear that he wants our standing with the Iranian people to be central to what we’re doing. If I had to categorize our strategy to different categories, it’s around: maximum economic pressure, restoring deterrence against regional aggression, and standing with the Iranian people. And not only the secretary, but the president, the vice president, have consistently talked about how the longest suffering victims of the Iranian regime are the Iranian people. Iranian people know that, they appreciate the fact that the president speaks up for them. This is a regime that robs their people blind. We’re coming up to the 40th anniversary of the [Iranian] Revolution. It’s been 40 years of broken promises. The Iranian economy, it’s a kleptocracy that benefits the governing elite, and people understand the hypocrisy of the Iranian regime. We call that regime for what it is. And the Iranian people know that they have a friend in Secretary Pompeo. Al Arabiya English: Is there evidence to suggest that the sanctions have actually weakened the regime? And if that is the case, will that mean more sanctions or will it be as things stand now? 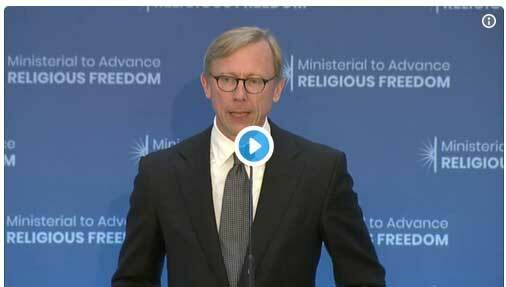 Brian Hook: Yes, our sanctions are weakening the regime. We have denied them billions of dollars of revenue through the loss of oil exports and there will be billions more that they will be losing. When we started our campaign, when the President announced he was leaving the deal, Iran’s oil exports were at 2.7 million barrels a day. You may have seen press reports, Iran’s November exports are below a million. So 2.7 to below a million in about eight months, 80 percent of Iran’s revenue comes from oil exports. So they are facing a liquidity crisis and they are also seeing a collapse in the Riyal. There will be more sanctions to come. Al Arabiya English: Do you have time frame in mind? How much time it will take for the regime to actually realize that confrontation isn’t the way forward? Brian Hook: That’s a good question. The Iranian regime today faces a choice: they can either start behaving like a normal country or they can watch their economy crumble. And our sanctions have only been in effect for a couple of months, but even prior to our sanctions being imposed against the regime, not the people, we saw a number of nations leaving the Iranian market. We’ve had over 100 major corporations disinvest from Iran. The SWIFT financial system has disconnected 50 or almost all major Iranian banks. We have a target of bringing Iran’s oil exports, crude imports to zero. It’s taking its toll on the regime, but this is the price the regime pays for being a revolutionary regime. It’s the last revolutionary regime on earth. It is a force of destabilization in the Middle East and beyond, as in Europe. I would say our coalition to counter Iran has been getting bigger. EU for the first time, a few days ago, imposed sanctions against Iranian regime, for the first time since adoption of Iran nuclear deal. They have conducted bomb plots and assassinations and assassination attempts in Europe, and I think Europe is increasingly frustrated with this regime’s outlaw behavior. Al Arabiya English: Starting with the visit by President Trump to Riyadh, the Saudi-US relations have gone from strength to strength. Where do you see this partnership going forward, especially in the context of the coalition building that Secretary Pompeo has been doing? 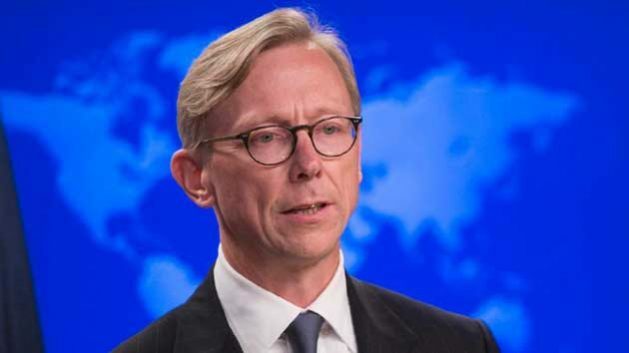 Brian Hook: The Saudi Energy Ministry, specifically Khalid al-Falih, had been very helpful in increasing production as we were taking off over a million barrels of Iranian crude between May and November. When the President announced that he’s leaving the Iran deal in May, oil was at $74. When we re-imposed sanctions, six months later, we took off roughly a million barrels of Iranian crude, and oil went to $72. We were able to do that through close cooperation with Saudi Arabia and they have helped to ensure that as we take off Iranian crude we have a stable and well supplied oil market. And so, I can only speak about the Iran piece, I don’t speak about the broader global energy issues. But Saudi Arabia has been very helpful, we have called for an urgent end to the fighting in Yemen, but we have also said that Saudi Arabia and the Emirates [UAE] need to defend themselves against the Iranian-backed Houthi attacks. And the Houthis continue to violate the ceasefire. We have a lot of confidence in UN envoy Martin Griffiths. He’s doing a great job. What has been underreported especially by the US press is the role Iran has played to prolong and deepen the war in Yemen. Iran bears a lot of responsibility for the humanitarian catastrophe in Yemen and I think the blame had been misallocated, and it’s important for people to understand that Iran has spent hundreds of millions of dollars organizing training and equipment for the Houthis to fight at a level well beyond what makes any sense for the Houthis. And as we work toward bringing an end to the fighting and a political solution, we have to keep our eye on Iran. We cannot allow Iran to do in Yemen what it accomplished in Lebanon, we cannot permit them to Lebanonize Yemen on Saudi’s southern border. And we know that Iran will try to become a power broker in Yemen, they have no legitimate interest in Yemen and they need to get out. This article was first published in Al Arabiya English.